Want to learn from Grammy-nominated guitarist Scott Nygaard? You can take lessons in-person in the San Francisco Bay Area. Email scottnyg (at) gmail.com to arrange a lesson. Sign up for one of Scott’s online courses at Peghead Nation. For just $20 a month you can take Scott’s Flatpicking Guitar, Roots and Bluegrass Rhythm Guitar, Intermediate Flatpicking Guitar, or Weekly Guitar Workout courses. Or take two for just $30 a month. Peghead Nation has more than a dozen roots-music courses in guitar, banjo, dobro, fiddle, mandolin, and ukulele, featuring some of the best musicians and teachers in the bluegrass/roots music world. Become a Peghead today at pegheadnation.com. With more than 35 years of teaching experience, including myriad guitar camps and workshops, Scott can teach a variety of levels and styles, including bluegrass, old-time, swing, jazz, folk, and various world flatpicking styles. He is a master of flatpicking technique and improvisation, and has a clear, concise method for learning the guitar’s fingerboard. He is also adept at diagnosing what a player needs to work on in order to advance technically and musically. Scott has recorded numerous instructional videos, including Bluegrass Lead Guitar, from which the video below is taken. 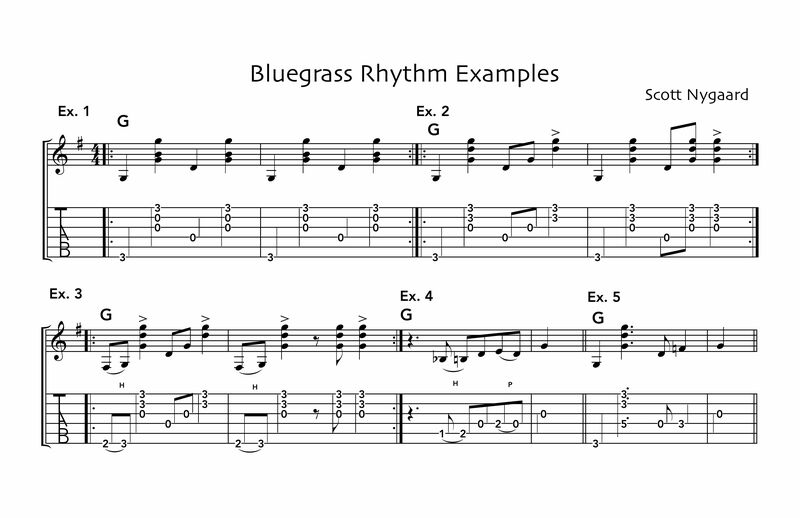 Scott also has a large library of songs and lessons in notation and tab, and can create new music to suit a student’s needs, as with the bluegrass rhythm guitar examples shown below. I have tried to sign up for classes in flatpicking and it keeps telling me my email address is not a real email address. Hi! I was your TA at walker creek this year and I wanted to take a lesson or two from you. I live pretty close so I could meet you in person, and I’m free most of July and September. Thanks a lot!